Gentle cycling from the Spanish border along the Eastern Algarve coast, passing beautiful beaches, wildlife sanctuaries, and traditional holiday destinations. Cycle the long-distance Ecovia along the Algarve coast. 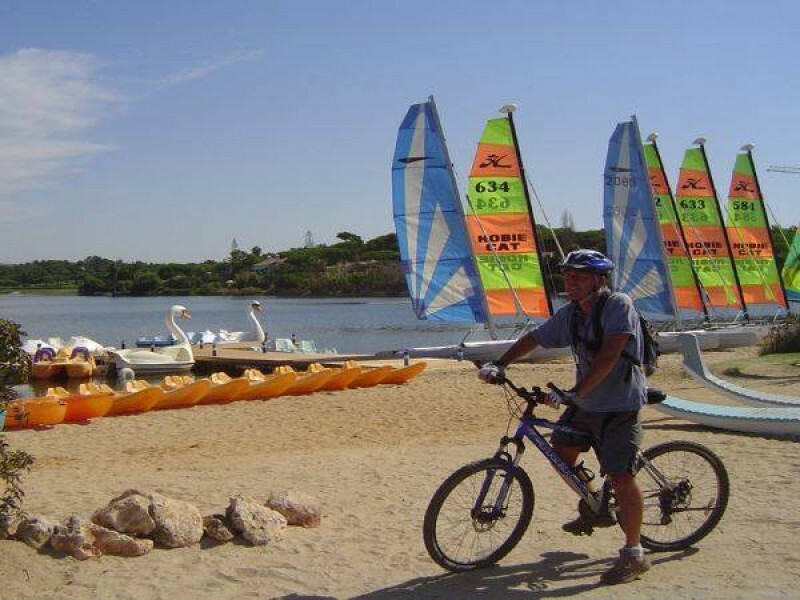 Visit Ria Formosa lagoon nature park perfect for wildlife and bird watching. Take in the traditional and new Algarve; from Tavira to Silves. After arriving at Faro Airport, your holiday tour includes a transfer to Vila Real de Santo António, an interesting old town on the banks of the Guadiana river, which forms the border between Spain and Portugal. Relax on your first night with a leisurely stroll around town or take in some sightseeing. Follow the Ecovia do Litoral cycle path, which is a dedicated biking route that runs along the Algarve coast. You will be passing through the coastal resorts of Monte Gordo and Altura, and then the ancient and picturesque village of Cacela Velha, where you can enjoy refreshments and take in the panoramic views across the Ria Formosa lagoon and out to sea. You should arrive in Tavira with plenty of time to have a look around this elegant old town dating back to Roman times. Starting from Tavira, this cycle route is another gentle day of cycling, mostly on flat terrain. There are cafes and restaurants along the way, and the route also passes through the charming fishing village of Fuseta. Olhão is the region’s main fishing port and the gateway to the many islands in the lagoon. Your route today heads inland, bypassing the regional capital Faro and skirting the famous Roman remains at Estoi. You will cycle into the hills, through quiet villages, to reach the old market town of Loule. Loule is an explorers haven, with its narrow-cobbled streets leading off the central Avenida that include tiny shops and hidden away bars and restaurants. Today you will have an opportunity to relax and explore the fascinating old town or relax by the rooftop swimming pool at the hotel, right in the centre of town. If you are still feeling energetic enough, you may choose to cycle down to the coast where some of the finest beaches in the Algarve are found. This cycling route is a more challenging day, in the rolling hills to the north of Loule, but well worth the effort for the tremendous scenery. You will head towards the tiny hill-top village of Querenca, a great coffee stop and a place to take in the splendid views. Your final destination for the day is the lovely hillside village of Alte. Famous for its white painted houses and fresh water springs, the year-round presence of water in the river adds a unique charm to the village. Today you will experience a ride to remember, with stunning views all along the way. There is a lovely ride along a dirt track road alongside the Barragem do Funcho, and then gently cruising down the valley to your destination for the day in the lovely historic town of Silves. Once a Moorish capital, Silves is steeped in history. It is an enchanting town on the banks of the Rio Arade and home to the best-preserved castle in the Algarve. Included transfer to Faro Airport for your flight home, or why not extend your holiday in Faro. This holiday is designed to be one of the easier and gentle cycling holidays we offer with a rest day roughly halfway through the week, cycling the Eastern Algarve area to Silves mainly on quiet tarmac roads and occasionally dirt tracks. Quality bike hires with panniers to carry your luggage and essential bike equipment included. Routes on our cycling holidays in Portugal may be subject to change or alteration. All route notes, maps and information are given to you upon arrival at the first hotel or the welcome meeting. GPS/GPX files are available for most of the cycling in the Algarve trips we offer. Please ask us for details about this Eastern Algarve and Monte Gordo cycling holiday. As with our Western Algarve cycling holiday, we recommend flying to Faro airport to reach the starting point of our Western Algarve cycling holidays. We recommend using Skyscanner to find the best flight prices by date or Voyages SNCF for European rail travel. There is customer car parking available at most hotels for a supplement. Please contact us for more details specifically regarding to this cycling tour of the Algarve. You do not need to go back to the starting point of our Eastern Algarve cycling holidays as all hire bikes are left at the final hotel. The Eastern Algarve bike holiday includes the daily transfer of luggage to the next hotel and local support if required.